During yesterday's live online chat, DAVID BOWIE was asked about the release of any material he and PLACEBO had recently done. Rednik: "Are we gonna see something get released from PlaceboWIE then?" David: "Yeah very definitely. As you well know, we did some recording a few weeks ago and that should be released within the next few weeks." David Bowie and Placebo spent the day in a New York studio (28th March) recording a new song together, plus their live version of '20th Century Boy' from The Brit Awards and also the encore at Placebo's NY Irving Plaza, 20th Century Boy and 'Without You I'm Nothing' - so take your pick from those. (Ed. My guess is a 3 track CD single, the new song plus the two tracks from Placebo NY show). This week's NME has MARK E. SMITH naming the tunes that made him a man! "With my mother's cooking? I don't know. Oh, with a girl. Probably 'Station To Station' by Dave Bowie. (Dissolves into fits of laughter) I always loved Dave Bowie. I think people underestimate Dave Bowie's influence on the British music scene. What would we have done without Dave Bowie? I remember going from station to station and missing a train at one point and it sums it all up for me. I met a girl at the train station and it brings it all back. I'm lying." On Tuesday, April 27th at 10:00 p.m. (EST), 7:00 p.m. (PST), 3:00 a.m. (GMT) (28th) BowieNet will proudly bring you a live chat with DAVID BOWIE. The CDNOW Interview: Film makers D.A. Pennebaker and Chris Hegedus have worked with Bob Dylan, Janis Joplin, DAVID BOWIE, The Who and many other artists who helped define the rock era. Do they have some stories for you! Q: Why did you film Bowie's last Ziggy Stardust concert? Pennebaker: "Well, he is incredible to watch. I mean, I could see myself getting a hard-on just looking at him sometimes, which is ridiculous. But I think that the reason we made it was because RCA said, we have this guy and he's going to do a concert, maybe the last one he's going to do, and you've got to go make a film." "I thought they said Bolan. I thought it was Marc Bolan I was going to do. And I was very excited because I really dug glitter rock. So I kind of set off with the wrong guy in mind. But I've spent time with Bowie, and I've seen him go into his head. He just disappears. He's like Dylan. He has someplace where it's just all music, and he's all alone." Read the full interview in the rock/pop section DA Pennebaker Interview here. Wasn't this supposed to be an interactive revolution? Sure, there are plenty of places to hear music online, but few where fans are able to manipulate the sound pouring forth from their computer - at least beyond volume and tone. To date, it's basically been a sort of jukebox phenomenon, albeit without the quarters. Luckily, a few innovators noticed the void, including Thomas Dolby, whose company recently released a free downloadable music player called Beatnik 2.0. Not only does this pump up the volume on anticipating sites, it also plays MP3s and, here's the kicker, it lets artists create interactive online songs. Dolby's first guinea pig: David Bowie's classic "Fame." If you visit Beatnik.com (formerly Headspace) or DavidBowie.com, you can follow the links to the "Interactive Fame Remix." First, you have to download and install the software. Then you launch the online application, wait about two minutes for the program to load (that was the waiting time on a 56K connection), and you're ready to remix. With just a few clicks, you'll be controlling how and when drums, bass, guitar, wah-wah, vocals and various lyrics fade in and out of the song. Even people with no rhythm whatsoever won't sound bad since the changes take effect at the start of the next measure. There's no way to screw it up. It's far more engaging than it sounds. And Bowie, who's always a step ahead of the pack when it comes to embracing new technology, apparently thinks it's pretty cool, too. "He's very involved," says Dolby. "And he gets very psyched about stuff that's going on with his Web site. He sometimes lurks around newsgroups under a pseudonym. As an artist, the Web is a fantastic place to get close to your fans and mingle among them. It's unique that way." Dolby has been Bowie's occasional go-to guy since 1985. "He called me about ten days before Live Aid and said that he didn't have a band," Dolby explains. "He asked me if I could help him get the right musicians together. I didn't have a history with him before this, other than adoring him as a teenager and staying out way too late at his concerts with makeup all over my face. But it was an unbelievable experience." The relationship ended almost as soon as it started. But when Bowie's techno-savvy son Duncan suggested that dad contact Dolby again, the team spirit picked up right where it left off. "In January, we came up with this idea of going back to one of his older tracks and putting a Web page together that would let users come in and mess around with it," says Dolby. "It was really a collaborative idea. I suggested 'Fame' because it's very suitable for this kind of treatment. It's groove-based so you can mix and match the different riffs and vocals." Dolby is quick to note that the company is not in the business of developing Web sites for others, but he does hope that artists will adopt the technology and start producing more musical pages. It doesn't require more than about $50 and a little curiosity. "We're already seeing this with early adopters at a grassroots level," says Dolby. "And we provide for them a gallery at our site where we give them free space to put up their own interactive music." How easy is it? Dolby created the "Fame" remix site on his laptop during a plane ride to London. "And I can't write a line of code," he adds. The buzz around MP3 has undoubtedly helped Beatnik, both conceptually and financially. "MP3 has validated the Internet as a vehicle for the delivery of digital music," Dolby says, "and we're shortly to announce a multi million dollar investment in Beatnik. I think MP3 is partly responsible for that." Meanwhile, MTV.com will soon launch its own Beatnik application. If Beatnik is a success, not only will we everyday Web surfers be interacting with songs online, we'll be ushering in a whole new way to experience the Web. "I think in a couple of years we'll look back and see that 1999 was still the silent movie era of the Web," Dolby explains. "And now we've moved on to the talkies." Join the UltraStar crew for an informal chat Monday, April 26th at 9:00 p.m. EST, 6:00 p.m. (PST), 3:00 a.m. (24th) GMT. They want to hear your thoughts and ideas about any BowieNet issues. Your feedback is taken seriously, so be part of the community and let your voice be heard. They will use the open chat forum (no moderation) for this one. If you have any questions you would like to ask before the live chat, you can e-mail your questions to tina@ultrastar.com they will use these pre-chat questions in addition to your live questions. Members log into the #ChatGuest room for this chat event. OH NO HERE'S COMES ANOTHER ONE!!! So is this just a smartly-dressed gangster - or DAVID BOWIE?... 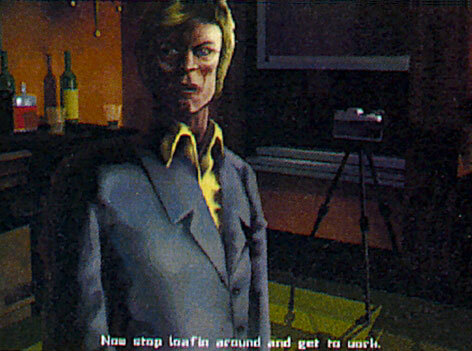 Following on from the David Bowie look-a-like character Hawk Manson who features in Fighting Force 64 from EIDOS, well bugger me here comes yet another look-a-like. GTA London is the latest expansion pack for fans of the original Grand Theft Auto game. The game is set in London at the end of the 60s - a time when London was apparently really swinging. If you thought that decade was a peaceful time, full of long-haired lovers, hippies, space oddities, mind-expanding drugs and music that was recorded backwards, then think again. It was a time of stealing cars, drug deals, hit-and-runs, drive-by-shootings and breaking the speed limit, or at least it is if you're playing Grand Theft Auto London. Priced at £19.99 - and yes you do need the original game to play it, developed for the PC and PlayStation.... oh by the way... you want yet another coincidence?... it's made by Rockstar Games! Press News: Gathering of Developers announced today it will publish the Grand Theft Auto: London 1969 mission pack for the PC. The mission pack will include Grand Theft Auto, which has sold more than 1.6 million copies on PC and PlayStation worldwide. The mission pack features all of Grand Theft Auto's great gameplay souped-up with groovy attitude, hip music and tongue-in-cheek action set in London in the late 60's. Developed by Rockstar Games, the PC game will cruise into stores nationwide in Spring 1999 for $29.95. Overview: For the past year there's been a crimewave in major American cities, now the criminal element has reached our capital. Yeah baby! The game still follows the same simple idea: Contact local gangs, run errands for them to earn money and respect, then be promoted to bigger crimes. The game is built around the idea of stealing cars; different cars are required for different jobs, and they all drive very differently. Not only are there fast cars to steal, but less desirable old bangers, too. Thirty-two new missions have been squeezed into the game, most of which have to be seen to be believed. Unlike most driving games, GTA London isn't restricted to certain streets - you can drive anywhere in the entire city. The beauty about the game is that not only does it give you a brand new city to drive around, but nearly everything has been reworked to lend the game a London feel. From the streets themselves - you can now drive on the left - and the sounds, buildings, music, and of course - cars. The music has been taken from Italian movies of the Sixties and some classic dub by The Upsetters, and is much better than the original game provided you like the sort of thing. So what of these new cars? Well there's 30 new models, and there are plenty of favourites from the original GTA. And as you'd expect, the majority of them are British. The first new car you'll probably spot is a famous black cab, after that the most common are the Mini, Ford Capri (spelt Crapi! ), and of course a double decker bus. There's also lots of Land Rovers, Reliant Robins, Morris Minors and E-Type Jags. Keep an eye out for the very fast Aston Martin. There's even a Union Jack-painted Jag in there, the preferred choice of none other than Austin Powers. Sadly, the emergency services of police cars, fire engines and ambulances haven't been updated since the original, which means there's usually lots of American police cars chasing you. The final icing on the cake to lend the game a London feel are the levels themselves. They'll have you whizzing back-and-forth between Hyde Park, Brixton, Angel and Soho. You'll find yourself stealing cars for bank jobs, being a couriers for a hot painting, taking hot a gang of mods, and jumping between building on a scooter full of drugs. There's also a mission where you steal gold bullion and race off in the back of a bunch of Minis (wonder where that idea came from). Famous landmarks also play a part, from the Tower Of London to Westminster, and Buckingham Palace, you'll be dealing with dodgy MPs, royalty and plenty of tourists, what more could you want? Opinion: So much has been changed that rather than just an expansion pack it almost feels like a sequel, and as it's going to be the first expansion pack on the PlayStation, it's kind of historic as well. The London theme works better than the American levels, as does the British humour when set in Britain. The music is also more evocative, the levels and the city have been well-designed, and the selection of cars is great. Unlike some expansion packs, it doesn't try to reinvent the original game, it just offers more to do, and new missions to complete, and it's well worth getting if you're a fan of the original. The EIDOS N64 game FIGHTING FORCE 64 which features Hawk Manson the DAVID BOWIE look-a-like has just been released in the USA. David himself mentioned in his journal (28th Aug 1998): "Rumour: Because of a visit Iman, Duncan and I made to Eidos a month or so ago I am somehow connected with the Nintendo 64 game Fighting Force 64. No. How would I have a connection to that skinny runt Hawk Manson?" Look at the pictures and make up your own minds. DAVID BOWIE will be the Commencement speaker at Berklee College of Music in Boston on May 7th 1999. The event will be webcast on Real Audio. Watch and listen on the Web as Berklee students pay tribute to David Bowie and Wayne Shorter at this year's Berklee Commencement Concert. Bowie and Shorter will be in the audience to hear the students' tribute, and both will speak during the next day's commencement ceremony. To see and hear the concert, you must have a minimum Internet connection of 28.8 Kbps, a version of RealPlayer®, and a World Wide Web Browser supported by RealPlayer. You can download RealPlayer for free at the RealNetworks Web site. If you have any questions about downloading or using RealPlayer, read the RealPlayer FAQ. For best results, use RealPlayer G2. Two musicians whose compositions and performances are central to the modern eras of rock and jazz will receive honorary doctor of music degrees at Berklee College of Music. Wayne Shorter and David Bowie will be honored at Berklee's 1999 Commencement, Saturday, May 8, at the Hynes Convention Center, Boston. Bowie will be principal speaker to more than 600 graduates and 3,000 guests. Shorter will also address the graduates. On commencement eve, at the Berklee Performance Center, students will present a concert tribute to the honorees, performing selections from their award-winning careers. The concert will be broadcast live, on Friday, May 7, at 7:30 p.m. EDT, on the Berklee Web site. Please bookmark the page and return for the live feed on commencement eve. David Bowie, as a musician, performer and songwriter, has continually reinvented himself and his art at a seemingly breakneck speed. With complete disregard for loyalty to any musical style, he has often combined the most unlikely forms of music with end-of-the-millennium subject matter, as the rock world's first post-modernist star. From his late '60s breakout hit, 'Space Oddity', to Ziggy Stardust, to his collaborations with Brian Eno, to his many film roles, to his most recent 'Earthling' disc and BowieNet Internet portal, Bowie's vision and body of work have been consistently challenging, prescient and affecting. Wayne Shorter is one of the most revered instrumentalists and composers in all of modern jazz. He has been central to some of the most important groups led by Art Blakey and Miles Davis, transforming hard-bop with the former, and playing a central role as Davis moved his second great quintet through long, post-bop forms into jazz-rock and electronics. Shorter's own co-founding of Weather Report, with Joe Zawinul '59 H'91, took jazz-rock in a new direction, while securing his place in the pantheon with the group's innovation and worldwide commercial success. Shorter's recent projects, with Herbie Hancock and his own groups, alternately explore inner landscapes and funky, electronic sounds. Shorter and Bowie will join such Berklee honorary doctorate recipients as Duke Ellington, B.B. King, Patti LaBelle, Sting, James Taylor, Pat Metheny, Dizzy Gillespie, Carly Simon, Billy Joel, Bonnie Raitt, and alumnus Quincy Jones. Representatives of the media who wish to receive additional information should contact Berklee's Office of Public Information, Sarah Godcher at 617/747-2658, Toni Ballard at 617/747-2247, or Emily Singer at 617-747-2567. A question put to BRIAN MOLKO of PLACEBO in this week's Melody Maker asked: "What is your most treasured memory?" "My most recent most treasured memory was being onstage at the Brit Awards with DAVID BOWIE, the two of us playing guitar and singing in harmony with each other - that was a real 'pinch me, I'm dreaming' situation. We weren't too bad, we were in key at least - but we could never really get the lyrics right. We were doing '20th Century Boy'. We had a f***ing laugh. DAVID BOWIE and PLACEBO have been talking about their mutual admiration society. Their collaboration at this year's Brits, where they performed a cover of T. Rex's '20th Century Boy' together, has led to newspaper campaigns for their joint version to be released as a single. Calls for the release were stepped up last week after Bowie joined Placebo onstage at the New York Irving Plaza for another shot at '20th Century Boy', plus Placebo's own 'Without You I'm Nothing'. The relationship between Molko's men and The Thin White Duke stretches back to the early days of Placebo, when they toured Europe together. To Molko, Bowie was a hero. To Bowie, Placebo were a band to champion. Brian Molko told The Maker's Psychobabble this week: "My most recent most treasured memory was being onstage at the Brit Awards with David Bowie, the two of us playing guitar and singing in harmony with each other - that was a real 'pinch me, I'm dreaming' situation. We weren't too bad, we were in key at least - but we could never really get the lyrics right. We were doing '20th Century Boy'. We had a f***ing laugh. A spokeswomen for Placebo said: "They supported David Bowie in their early days. That's how it started. The relationship's been quite a long-term thing. He invited them to play at his 50th birthday celebration at Madison Square Garden." Bowie said of Placebo: "I'll say I spotted them. I thought they were terrific, and Virgin let me have their very earliest things, including the song 'Nancy Boy'. I thought, 'That's a terrific song for a bunch of jacks to sing - I think they'll be huge.' And then we got together in '96." That was on Bowie's 'Outside' tour. Placebo later supported on his 'Earthling' tour. Bowie continued: "I kept on at them like a dog with a bone, excuse the pun, to put out 'Nancy Boy' which, of course, became a very good song. All their songs, of course, are very good, I think their songs are much better now. "It's been a consistent relationship. I mean, it's not been stops and starts. I think we brought together quite a lot. I've enjoyed it a lot watching then grown into old age as well... because I'm never gonna die. "I certainly feel that Placebo are one of the major important bands of the moment, as yet just breaking, just touching the cusp of fame in the States, but I'm sure that they'll be all over (American) radio any day now." Bowie and Placebo conducted an Internet chat together on March 29, the day of the New York gig, in which one fan asked: "Placebo, do you consider David Bowie to be your mentor if friend?" The band replied: "Our friend." Bowie told Placebo: "I must say, I like your penchant for poignant romanticism. I really like that a lot because I'm big on that sort of stuff." While The Mirror has called for the release of The Placebo/Bowie version of '20th Century Boy', we'd be wise not to hold our breath. Placebo's spokeswoman said: "The band did '20th Century Boy' for 'Velvet Goldmine' and they released it on the B-side of 'You Don't Care About Us', which was out in September last year, so I doubt they'd do it again." Bowie's spokesman was more optimistic. He said: "There's been a huge amount of public demand for the song. Everyone loves the idea of it. They've just performed together, they are great friends and, at the end of day, it's their call." Happy Birthday Jordan - Have a wonderful day! This week's NME has FRANK BLACK naming the tunes that made him a man! "Or, in my case, the question would be the tour 'van'. The last time that I played it was sort of the first time I played it. So it didn't clear the van, but I imagine if I play it again it might. I bought this tape at a truckstop that's like a combination of the first two David Bowie albums from the late-60's. All those songs that sound kinda like theatre music; it's pretty wild stuff, and it's great, but it's also pretty annoying. No, maybe I shouldn't say that. David Bowie will read it or something, and I'll never work again." The May 1999 issue of CELEBRITY STYLE magazine contains a short feature on DAVID BOWIE entitled: "The Music Issue: Who Matters And Why." To our twelve year David Bowie touring companion... news gathering... postcard buying... bestest mate! 'Allo Ste' Boy... Happy Birthday mate! NETGALERIE is a new web site of news, pictures and links with a page about DAVID BOWIE refreshed with news pictures every month. All pictures are rare and exclusive. According to THE SUNDAY TIMES their 'Britain's Richest 1,000' for 1999 places DAVID BOWIE in equal 227th place. A two-day Bowiefest is planned for Saturday and Sunday 21st / 22nd August 1999. Attractions include the screening of never before seen Ziggy Stardust footage from Aylesbury and Dunstable 1972, rare audio material, videos, live bands, Bowie disco, auction, trading stalls, special guests and lots lots more. This years convention is being organised by David Priest, Paul Kinder, Frank Toal and Stephen King - further details will follow soon. If you are interested in performing at Bowicon99 please get in contact with David Priest - Now! Go easy on the chocolate!!! There is little doubt that the Mini is one of the most stylish cars on the road but an exhibition which opened on February 9 at the Design Museum in London confirmed the Mini has design icon status. The exhibition is entitled "Mini: 40 Years of a Design Icon" and forms part of the official 40th Anniversary celebrations. The core of the exhibition are the three art cars designed by DAVID BOWIE, Kate Moss and Paul Smith. These cars provided the inspiration for a nationwide competition where entrants were invited to produce a design for the external bodywork of the car. The winner was unveiled on the opening night of the show, and a very pleased Mark Ward from Hounslow picked up the keys to a brand new Mini Cooper as a reward for his efforts. Mark's design ties in very well with this year's anniversary as it is entitled 'The Mini Time Machine' - represented by the white clockwork design over the green base - and signifies the Mini's timeless appeal which has transcended four decades. The car was unveiled by Sir Terence Conran, chairman of the Design Museum. Apart from the stunning paint scheme, the boot of the Mini was stuff solid with hi-tech equipment - apparently a Temporal Displacement Drive (MKII) - a time machine, no less. The exhibition also features exhibits which chart the changes in the Mini over 40 years. It's all well worth a visit and the show will run until May 9 1999. The Design Museum, Shad Thames, London SE1. (Ed. By the way, while we are on the subject of cars... check the date on the story below concerning the 'Ziggy Beetle'... sorry!). David also mentions that he and Reeves are putting the finishing touches to a bunch of songs for release later this year. The wondrous SISTEURS OF UTTER DESTRUCTION (SOD) have launched their Exclusive David Bowie 'Fully Approved' Competition 'What's Really Happenin', Dammit!?' at their web site. After his successful and critically acclaimed design of the 'Mirrored Mini, to celebrate their 40 year anniversary, DAVID BOWIE has been invited to submit designs for a new Millennium 2000 production model of the Volkswagen Beetle. Volkswagen say they ideally would like a follow-up to their stylish and media successful 'Herbie' for the year 2000. A spokesman for Volkswagen commented: "The Volkswagen Beetle is a timeless design... we would like nothing more than to sprinkle the new 2000 model edition with a little Ziggy Stardust." "The 'Millennium Model' is expected to be a limited edition model costing somewhere in the region of £15,000. David's initial idea is to design the 'Ziggy' version with a lightning bolt design across the roof.